Nature was at its most furious in the town of Rameswaram, located deep in South India. In its fury, an old man lost all that he had: his household items, his small house and his only boat, his source of livelihood. Helpless and distraught, he sent a telegram to his youngest son, who was doing his second year engineering in Madras (now Chennai) to return home as soon as possible. Far away from his loved ones, the young man felt helpless: he had no money... there seemed to be no way he could go home and be with his family in their hour of need. The only valuable possession that he had, which he thought might fetch him some money, was a book. He decided to sell it. The shocked shopkeeper asked the young man, "Who is this Abdul Kalam?" "I," the young man replied. "This is an award for you from the vice-chancellor. Why do you want to sell it?" The story the young man told him so moved the shopkeeper that he told him, "Young man, don't sell the book. I will give you the money as a loan and I will keep the book in safe custody for you. You go home now and come back and collect the book when you have the money." Though this event occurred many decades ago, such memories flooded A P J Abdul Kalam's mind when he entered the Madras Institute of Technolgy campus. "He narrated the story to me one day while we were talking about our student days," said Dr A Kalanidhi, former vice-chancellor, Anna University. Ever since the ruling National Democratic Alliance announced Kalam as its nominee for the post of President of India, Anna University has become a much talked about institution. At the university, Kalam, the man expected to be the nation's next President, lived in one of the guest rooms in the campus and held the honorary post of Padmashri T Muthiah Professor's Chair. It was Kalanidhi, then vice-chancellor of Anna University, who was instrumental in bringing former student Kalam back to the university. "When I read in the newspapers that Kalam was planning to join the Indian Institute of Science, Bangalore, as professor after his stint as principal scientific advisor to the government ended, I contacted him immediately and requested him to consider occupying a professor's chair at Anna University. After all, he was a former student," Kalanidhi recalls. He even remembers the date he called up Kalam in Delhi: September 12, 2001. Kalanidhi assured Kalam the chair would be honoured if a person of his calibre occupied it. "I told him Anna University would get a better name if great people like him occupied the chair and helped in the university's development," Kalanidhi told rediff.com. After a long discussion, Kalam promised to call back after thinking about the offer. Kalanidhi left for the United States immediately thereafter. A few days later, when he was at Boston airport on his way to Chicago, Kalam called and expressed his willingness to work at Anna University. They decided to meet in Chennai. Kalam went to the vice-chancellor's office on September 29 and everything was finalised. As professor, he wanted to work on 'technology and societal transformation'. He also expressed a great desire to meet students at the university and in schools at regular intervals as he felt students were the future of India. On October 2, Kalam occupied the chair. A room and two attendants were provided for a man who was known to be simple and hated ostentation. An office room, an Internet connection, two research scholars and two stenographers were all that he had at the university. Of course, he had to put up with the security personnel provided by the Indian government. Kalanidhi and Kalam had planned to travel abroad to meet the university's alumni, now working in countries such as the United Arab Emirates, United Kingdom, United States, Germany and Japan They planned to raise funds for the university. "If you look at universities in Western countries, you will see that most of them flourish with the help of their alumni," said Kalanidhi. "But in our country, alumni support is not talked about at all. We wanted to change that and develop an alumni network. As Kalam represented the scientific community of India, I didn't want him to be a representative of the university alone. He readily agreed to the idea and we had planned everything in detail for July. We had informed all our old students and both of us were quite excited about our plans for the university." Not surprisingly, Kalanidhi is disappointed that the journey cannot take place now. "It's not just me, even Kalam is disappointed." But he is, of course, happy on one count: Kalam wants to continue his research activities and teach even after occupying the highest office in the country. Perhaps, for the first time, the President of India may teach students at Anna University while continuing to guide his two research scholars from Rashtrapati Bhavan! 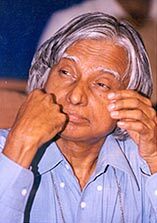 Kalanidhi likes to recall his first meeting with Kalam in 1990, when the latter was working on a cryogenic engine. It was at a conference in Hyderabad and Kalanidhi still cannot get over his surprise when he met the director of the laboratory. "All of us were sitting in the conference room and discussing the problems that we faced. We thought the director was yet to come in, as the main chair was empty. After some time, I asked, 'Where's the director?' It was only then that somebody noticed a man sitting along with us, wearing the laboratory uniform! I have not seen such an unassuming and simple man in my entire life. I feel so elated that such a man will be the First Man of the country. It will be a great day for the Indian scientific community when he is installed at Rashtrapati Bhavan." During his brief stay at Anna University, Kalam walked for hours every day around the university campus, enjoying the beauty of nature and dreaming about the country. It was during one such walk that he noticed the huge banyan tree that was struggling to branch out. He also saw students sitting under the tree, reading. Later, he told the vice-chancellor, "We should give support to the roots that are trying to touch the soil. Only if we allow the tree to grow horizontally will it grow strong and give shade to more and more students."